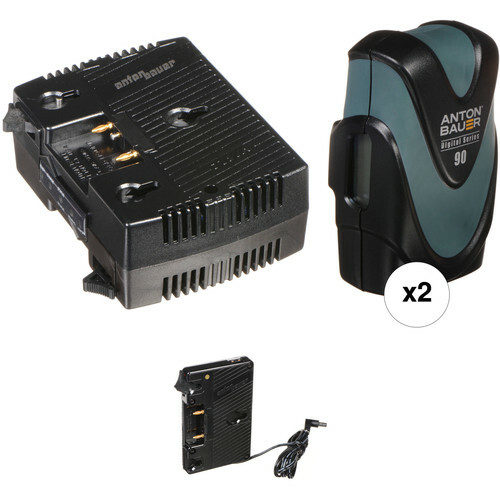 The Anton Bauer Gold Mount Plate with 2 Batteries & Charger Kit for Blackmagic, from B&H, combines two batteries and a two position charger with a plate designed specific to the Blackmagic Cinema Camera's power input. Altogether, the four items provide a non-stop power solution for the camera. One battery can be swapped for the other, and the camera's internal 90 minute battery will kick in during the swap. The Gold Mount plate features a right-angled 2.5mm unregulated DC connector on a 2 ft integrated cable. For powering accessories simultaneously with the camera, the plate has two P-Tap outputs. The Blackmagic camera, with its minimalist design, has no space to mount a plate. To compensate for this, the plate attaches to a rig via an optional cheese plate, like Anton Bauer's MATRIX cheese plate, which is capable of mounting both 15 and 19mm rods. The two batteries included are Anton Bauer's Digital 90 14.4V batteries. They each have a 93 Wh peak capacity, and could each power the camera for about four hours, unless you're shooting 2.5K raw, which requires more power. The charger can charge any two Gold Mount Logic Series batteries at the same time, and does so in three stages. Stage one delivers a high-rate charge that matches a battery's chemistry and capacity, stage two equalizes any imbalance of a battery's cells, and stage three keeps a battery from self-discharging without causing any damage. The Anton Bauer QRC-BMD Gold Mount Plate allows you to add extended battery power, along with support for two accessories, to your Blackmagic Cinema Camera or Production Camera 4K. Box Dimensions (LxWxH) 7.717 x 4.331 x 1.339"
Is this kit compatible with the Blackmagic URSA? The batteries and charger are compatible, however the plate included in this kit is missing the 12-way Molex connector needed to power the Blackmagic URSA camera, instead this is the appropriate plate needed to use Gold mount batteries: B&amp;H# SWGPAURSA.